The Library licenses over 1.5 million electronic holdings and titles, including indexes, databases, individual e-journals and e-journal packages, e-books and datasets. All of these support faculty research and student curriculum needs. Many resources are acquired as assets with perpetual access rights to the content. More than 70% of the Library’s collections budget is allocated to purchases from US vendors and publishers. 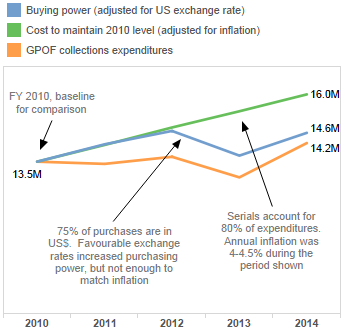 In the last fiscal year (2013-2014), the acquisitions budget was adversely affected by serials inflation (on average six to eight percent) and fluctuations with the US currency exchange. The Library is implementing a cost reduction strategy to determine renewals and purchases with the current budget, and to make sure acquisitions budget expenditures are sustainable. The Library provides a crucial service for UBC’s research environment, supporting research, innovation and teaching. In order to sustain and grow research, access to the materials and outputs of scholarly research in digital formats is critical. The Library will strive to maintain strategic core resources to support faculty and student research and information. Subject liaisons began a review process over the summer of 2014. Consultations with library staff and faculty occurred as items were considered for non-renewal or retention. Library branch heads will receive potential cancellation lists and share with their faculty constituents on an ongoing basis. Lists of cancellations are posted on the Library’s website and will be amended throughout the year as consultations continue. The focus of the review is areas with the highest expenditures, including Medicine, Sciences, Humanities, Social Sciences, Business, and Law. Given the deadline for some of these renewals, the Library has been unable to consult on all cancellation decisions; however liaison librarians may be in touch with faculty to discuss possible cancellations that will take place later in the year. It is significant to note that reviewing the renewals and acquisitions on an annual basis is standard practice. Doing so ensures that the Library continues to provide our faculty, staff and students with collections that are essential to research and teaching. However, during this review, the Library has a target fiscal goal given the rising inflation and currency rates. We will work with faculty to best determine how to maximize our costs within the budget envelope. For feedback about the collections cost reduction strategy, please contact us. The depth and breadth of the library’s collections places UBC Library in the top tier of North American research libraries, ranking 2nd in the Canadian Association of Research Libraries group and 14th out of the 124 libraries that form the Association of Research Libraries.